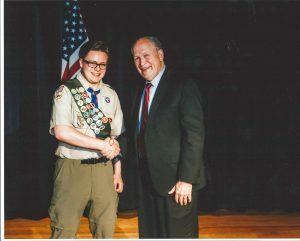 On March 24, Ryan Gump, a former RAISE program participant, was recognized for achieving the rank of Eagle Scout with Troop #26 of the Boy Scouts. Governor Walker was present at the ceremony to shake his hand in congratulations. While in RAISE, Ryan served as an intern with the Knik Tribal Council. He will be graduating from high school this summer and is a positive example of what youth can do when provided mentorship and opportunity. The RAISE program helped guide and inspire him to gain confidence and set challenging personal goals. SCF is proud of Ryan’s accomplishments, and wishes him continued success in his future endeavors.